"Wołyń" and "Volinia" redirect here. For the Polish village, see Wołyń, Łódź Voivodeship. For the township of Cass County in the U.S. state of Michigan, see Volinia Township, Michigan. 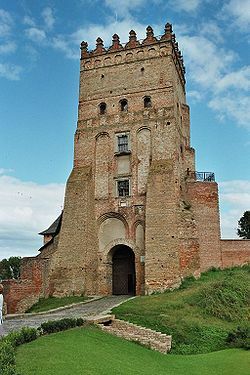 Lubart's Castle (Lutsk) was the seat of the medieval princes of Volhynia. Volhynia (/voʊˈlɪniə/; Polish: Wołyń, Ukrainian: Волинь, translit. Volýn), is a historic region in Central and Eastern Europe, situated between south-eastern Poland, south-western Belarus, and western Ukraine. While the borders of the region are not clearly defined, the territory that still carries the name is Volyn Oblast, located in western Ukraine. Volhynia has changed hands numerous times throughout history and been divided among competing powers. At one time all of Volhynia was part of the Pale of Settlement designated by Imperial Russia on its southwestern-most border. Important cities include Lutsk, Rivne, Volodymyr-Volynskyi (Volodymyr), Iziaslav, and Novohrad-Volynskyi (Zviahel). After the annexation of Volhynia by the Russian Empire as part of the Partitions of Poland, it also included the cities of Zhytomyr, Ovruch, Korosten. The city of Zviahel was renamed Novohrad-Volynsky, and Volodymyr became Volodymyr-Volynskyi. The alternative name for the region is Lodomeria after the city of Volodymyr-Volynsky (previously known as Volodymer), which was once a political capital of the medieval Volhynian Principality. According to some historians, the region is named after a semi-legendary city of Volin or Velin, said to have been located on the Southern Bug River, whose name may come from the Proto-Slavic root *vol/vel- 'wet'. In other versions, the city was located over 20 km (12 mi) to the west of Volodymyr-Volynskyi near the mouth of the Huczwa [pl] River, a tributary of the Western Bug. 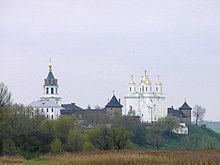 Mezhyrich Abbey in Ostroh was endowed by the Ostrogski princes in the 15th century. Geographically it is located in the Volhynian-Podolian Upland and Polesian Lowland along the Prypyat valley as part of the vast East European Plain, between the Western Bug in the west and the Ovruch Ridge and Dnieper Upland in the east. Before the partitions of Poland, the eastern edge stretched a little west along the right-banks of the Sluch River or just east of it. Within the territory of Volhynia is located Little Polisie, a lowland that actually divides the Volhynian-Podolian Upland into separate Volhynian Upland and northern outskirts of Podolian Upland, the so-called Kremenets Hills. Volhynia is located in the basins of the Western Bug and Prypyat, therefore most of its rivers flow either in a northern or a western direction. Relative to other historical regions, it is northeast of Galicia, east of Lesser Poland and northwest of Podolia. The borders of the region are not clearly defined, and it is often considered to overlap a number of other regions, among which are Polesia and Podlasie. The territories of historical Volhynia are now part of the Volyn, Rivne and parts of the Zhytomyr, Ternopil and Khmelnytskyi Oblasts of Ukraine, as well as parts of Poland (see Chełm). Major cities include Lutsk, Rivne, Kovel, Volodymyr-Volynskyi, Kremenets (Ternopil Oblast) and Starokostiantyniv (Khmelnytskyi Oblast). Before World War II, many Jewish shtetls (villages), such as Trochenbrod and Lozisht, were an integral part of the region. At one time all of Volhynia was part of the Pale of Settlement designated by Imperial Russia on its southwesternmost border. The land was mentioned in the works of Arabian scholar Al-Masudi, who denoted the local tribe as "people of Valin". In his work of 947-948, Al-Masudi mentions the Valinians as an intertribal union ruled by their leader Madjak. Volhynia may have been included (or was in the sphere of influence) in the Grand Duchy of Kiev (Ruthenia) as early as the 10th century. At that time Princess Olga sent a punitive raid against the Drevlians to avenge the death of her husband Grand Prince Igor (Ingvar Röreksson); she later established pogosts along the Luha River. In the opinion of the Ukrainian historian Yuriy Dyba, the chronicle phrase «и оустави по мьстѣ. погосты и дань. и по лузѣ погосты и дань и ѡброкы» (and established in place pogosts and tribute along Luha (лузѣ), the path of pogosts and tribute reflects the actual route of Olga's raid against the Drevlians further to the west, up to the Western Bug's right tributary Luha River. As early as 983, Vladimir the Great appointed his son Vsevolod as the ruler of the Volhynian Principality. In 988 he established the city of Volodymer (Володимѣръ). The first records can be traced to the Ruthenian chronicles, such as the Primary Chronicle, which mentions tribes of the Dulebe, Buzhan and Volhynian peoples in the year of 1077. Volhynia's early history coincides with that of the duchies or principalities of Halych and Volhynia. These two successor states of the Kievan Rus formed Halych-Volhynia between the 12th and the 14th centuries. Pochayiv Lavra, the spiritual heart of the Ukrainian Orthodox Church in Volhynia. After the disintegration of the Grand Duchy of Halych-Volhynia circa 1340, the Kingdom of Poland and the Grand Duchy of Lithuania divided the region between them, Poland taking Western Volhynia and Lithuania taking Eastern Volhynia (1352–1366). After 1569 Volhynia was organized as a province of the Polish-Lithuanian Commonwealth. During this period many Poles and Jews settled in the area. The Roman and Greek Catholic churches became established in the province. In 1375 a Roman Catholic Diocese of Lodomeria was established, but it was suppressed in 1425. Many Orthodox churches joined the latter organization in order to benefit from a more attractive legal status. Records of the first agricultural colonies of Mennonites, Protestants from Germany, date from 1783. After the Third partition of the Polish-Lithuanian Commonwealth in 1795, Volhynia was annexed as the Volhynian Governorate of the Russian Empire. It covered an area of 71,852.7 square kilometres. Following this annexation, the Russian government greatly changed the religious make-up of the area: it forcibly liquidated the Ukrainian Greek Catholic Church, transferring all of its buildings to the ownership and control of the Russian Orthodox Church. Many Roman Catholic church buildings were also given to the Russian Church. The Roman Catholic Diocese of Lutsk was suppressed by order of Empress Catherine II. In 1897, the population amounted to 2,989,482 people (41.7 per square kilometre). It consisted of 73.7 percent East Slavs (predominantly Ukrainians), 13.2 percent Jews, 6.2 percent Poles, and 5.7 percent Germans. Most of the German settlers had immigrated from Congress Poland. A small number of Czech settlers also had migrated here. Although economically the area was developing rather quickly, upon the eve of the First World War it was still the most rural province in Western Russia. When World War I began in 1914, there were 1,621,000 Germans living in the Russian Empire. The number of German colonists living in the settlements of Russian Volhynia totalled 150,000. Russia's declaration of war against the German empire came as a great shock to all German Russians. Despite their repeated declarations of unconditional loyalty to Russia and its emperor, the ethnic Germans increasingly became objects of suspicion and even hate. They were a scapegoat for Russian military defeats, economic problems and administrative ineptness in pursuing the war. The German Russians joined the army willingly, prepared to fight against their former ancestral homeland. Over 250,000 German colonists served in the Russian army during the war. Most German Russians, however, were not sent to the Western Front to fight against the German and Austrian armies, but to the Caucasus to fight on the Turkish front. Those who initially served in the West were subsequently removed and also sent to the Caucasus. As Russia's war losses increased, so did anti-German hysteria. They were held responsible for the disastrous course of the war and were accused of being spies and saboteurs betraying Russia. Anti-German measures reached a nadir with the government's so-called Liquidation Laws, of February 1915, authorizing it to expropriate German properties in the Western border provinces, especially in Volhynia. Compensation was envisaged in the form of 25-year government obligations. The laws were not enforced immediately due to the concern over economic disruption. The passage of the decrees, however, caused great anxiety in many German villages, particularly in the province of Volhynia. Some people made panic sales or neglected the land in expectation that it would be appropriated. Grand Duke Nicolas (who was still commander-in-chief of the Western forces), after suffering serious defeats at the hands of the German army, decided to implement the decrees for the German Russians living under his army's control, principally in the Volhynia province. The lands were to be expropriated, and the owners deported to Siberia. The land was to be given to Russian war veterans once the war was over. In July 1915, without prior warning, 150,000 German settlers from Volhynia were arrested and shipped to internal exile in Siberia and Central Asia. (Some sources indicate that the number of deportees reached 200,000). Ukrainian peasants took over their lands. The mortality rate from these deportations is estimated to have been 63,000 to 100,000, that is from 30% to 50%, but exact figures are impossible to determine. The March 1917 revolution, and the Czar's abdication later in March of that year, put a stop to further confiscation measures against German colonists in Russia; they were never carried out. The liquidation decrees were suspended by the Provisional Government. The new government issued a declaration of human rights whereby all national minorities, including Germans, were given full equality. For the Volhynian Germans, however, these actions came too late. The greater part of the population had been deported. Although they were permitted to return and attempt to reclaim their land, it is estimated that only one-half of their number did so. Many found their houses destroyed and their farms occupied by strangers. At the end of the First World War, nationalists tried to form the Ukrainian National Autonomy. The territory of Volhynia was split in half by a frontline just west of the city of Lutsk. Due to an invasion of the Bolsheviks, the government of Ukraine was forced to retreat to Volhynia after the sack of Kiev. Military aid from the Central Powers brought peace in the region and some degree of stability. Until the end of the war, the area saw a revival of Ukrainian culture after years of Russian oppression and the denial of Ukrainian traditions. After German troops were withdrawn, the whole region was engulfed by a new wave of military actions by Poles and Russians competing for control of the territory. Ukraine was forced to fight on three fronts - Bolsheviks, Poles and a Volunteer Army of Imperial Russia. In 1921, after the end of the Polish–Soviet war, the treaty known as the Peace of Riga divided the Volhynian Governorate between Poland and the Soviet Union. Poland took the larger part and established Volhynian Voivodeship. Most of eastern Volhynian Governorate became part of the Ukrainian SSR, eventually being split into smaller districts. During that period, a number of national districts were formed within the Soviet Ukraine as part of cultural liberalization. The policies of Polonization in Poland led to formations of various resistance movements in West Ukraine and West Belarus, including Volhynia. In 1931 the Vatican of the Roman Catholic Church established a Ukrainian Catholic Apostolic Exarchate of Volhynia, Polesia and Pidliashia (Wolhynien, Polissia und Pidliashia in German), where the congregation practiced the Byzantine Rite in Ukrainian language. From 1935 to 1938 the government of the Soviet Union deported numerous nationals from Volhynia in a population transfer to Siberia and central Asia, as part of the dekulakization, an effort to suppress peasant farmers in the region. These people included Poles of Eastern Volhynia (see Population transfer in the Soviet Union). Following the signing of the Molotov–Ribbentrop Pact in 1939 and the subsequent invasion and division of Polish territories between the Reich and the USSR, the Soviet Union invaded and occupied the Polish part of Volhynia. In the course of the Nazi–Soviet population transfers which followed this (temporary) German-Soviet alliance, most of the ethnic German-minority population of Volhynia were transferred to those Polish areas annexed by Nazi Germany. Following the mass deportations and arrests carried out by the NKVD, and repressive actions against Poles taken by Germany: deportation to the Reich to forced labour camps, arrests, detention in camps and mass executions, by 1943 ethnic Poles constituted only 10–12 % of the entire population of Volhynia. During the German invasion, around 40,000–60,000 Polish people in Volhynia were massacred by the Ukrainian Insurgent Army. The number of Ukrainian victims of Polish retaliatory attacks until the spring of 1945 is estimated at approx. 2,000−3,000 in Volhynia. In 1945 Soviet Ukraine expelled ethnic Germans from Volhynia following the end of the war, because Nazi Germany had used ethnic Germans in eastern Europe as an excuse to invade those areas. The expulsion of Germans from eastern Europe was part of a mass population transfer after the war. Soviet Ukraine annexed Volhynia after the end of World War II. In 1944 the communists in Volyhnia suppressed the Ukrainian Catholic Apostolic Exarchate. Most of the remaining ethnic Polish population were expelled to Poland in 1945. Since the dissolution of the Soviet Union in the 1990s, Volhynia has been an integral part of Ukraine. ^ E.M. Pospelov, Geograficheskie nazvaniya mira (Moscow, 1998), p. 104. ^ Michael Jones (2000). The New Cambridge Medieval History. Cambridge University Press. p. 770. ISBN 0-521-36290-3. ^ Oreck, Alden. "Jewish Virtual Library-The Pale of Settlement". Jewish Virtual Library. Jewish Virtual Library. Archived from the original on October 18, 2013. Retrieved July 10, 2013. ^ Meyers Konversations-Lexikon. 6th edition, Vol. 20, Leipzig and Vienna" 1909, pp. 744-745. ^ Merten, Ulrich (2015). Voices from the Gulag: the Oppression of the German Minority in the Soviet Union. Lincoln Nebraska: American Historical Society. pp. 77, 78, 79, 80, 82. ISBN 978-0-692-60337-6. Kathryn Ciancia, "Borderland Modernities: Poles, Jews and Urban Spaces in Interwar Volhynia," Journal of Modern History, forthcoming 2016. Central European Superpower, Henryk Litwin, BUM Magazine, October 2016. Look up Volyn in Wiktionary, the free dictionary. Wikimedia Commons has media related to Volhynia. This page was last edited on 10 February 2019, at 10:10 (UTC).